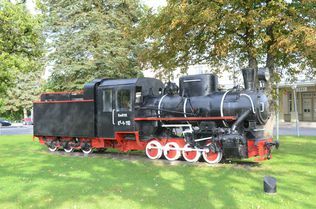 PT-4 153 is a Finnish loco, built at Tampella in 1948. 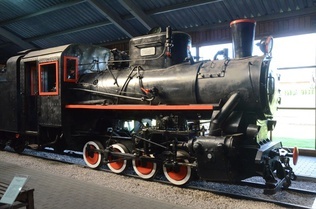 It is now preserved at Šiauliai in Lithuania. 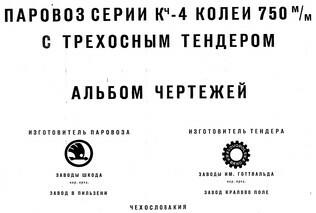 Cover page of the drawings for the Kch-4, built in Czechoslovakia by Skoda. Kch-4 017 is an early Czech loco, built by Skoda in 1949. 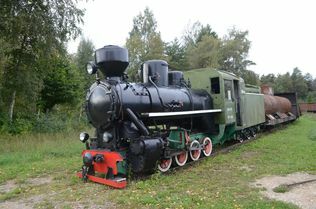 It is now preserved at Anykščiai in Lithuania, on the surviving narrow gauge line there. 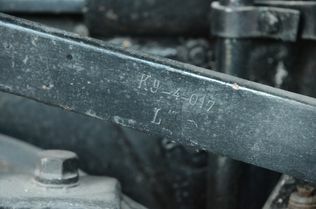 Many of the 28t locos built in Europe have their identity stamped into components such as the radius rod and front bufferbeam. 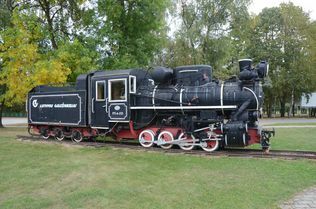 Sister Czech loco Kch-4 110 is also preserved at nearby Turi, Estonia. 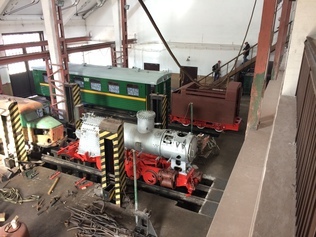 It is paired with a Polish tender. Kch-4 332 was built in 1950, and is basically a 'runner' though it is currently out of service having new tubes fitted. It has been updated with all 'mod cons' including air braking, speedometer and data recorder! 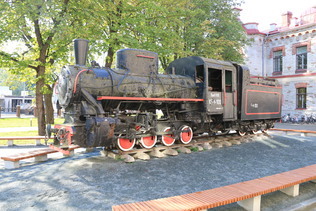 It is based at the Lavassaare Railway Museum, Estonia. 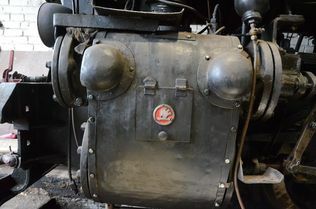 The Skoda Kch-4 locos originally carried their manufacturer's logo on the cylinders, and some still have these emblems. 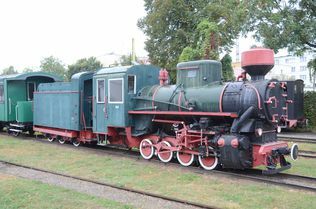 Kp-4-708 is a Polish loco built in 1957. 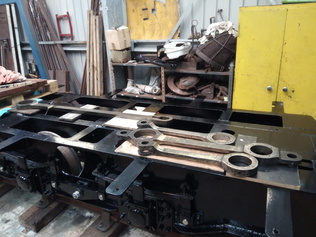 It is currently being restored to working order at Panevezys for operation on the narrow gauge railway there. The workshop facilities at Panevezys, Lithuania, are impressive - this is just one of many sheds and workshops. This was once the hub of a massive 750mm gauge railway network. 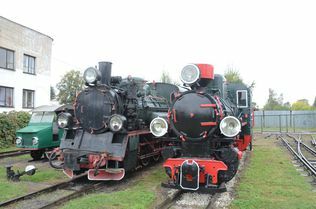 The narrow gauge railway museum at Sochaczew, Poland, has a huge collection of steam locomotives, including two Kp-4s that somehow avoided being exported to Russia. Here Chrzanow 3760 of 1957 stands next to a Px48, illustrating the size difference between the classes. At some stage it has acquired some enormous headlamps! Sister loco Chrzanow 3761 of 1957 is also at Sochaczew. Its tender is spaced further from the loco, and the cab has been fitted with enclosed rear doors and a handbrake. Both these locos retain their original spark-arresting chimneys. This is a rare survivor: VP-1-899 built at Votkinsk in Russia. 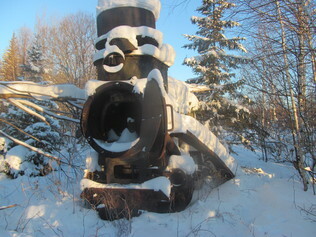 Note the separate dome and sandbox casings which are characterisic of the Russian locos. 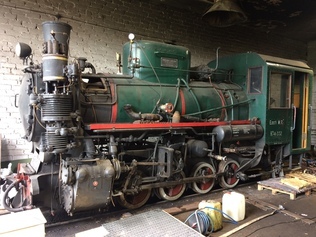 It spent its entire life in Estonia and has run in preservation, but is now a static exhibit at Lavassaare railway museum. 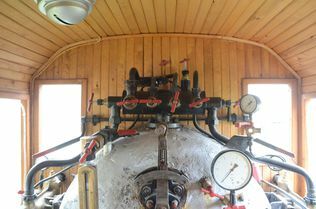 A peek inside the firebox of the VP-1 shows the corrugated firebox crown that was a feature of the later production in Russia. 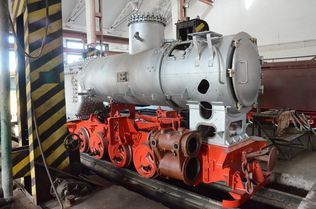 The early Chinese locos built at Shijiazhuang also had this type of firebox. The Soviets sent the PT-4 drawings to Germany after WWII and there were plans to have some built there. Instead, the Germans built a larger class of 0-8-0 for the USSR, which was designated Gr (German reparations). 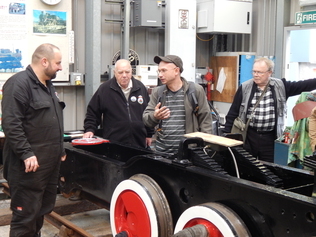 The locos were about 10 tonnes heavier than a C2, with larger boiler and wheels. Here, preserved Gr-319 hauls a short passenger train on the narrow-gauge railway at Gulbene in Latvia. 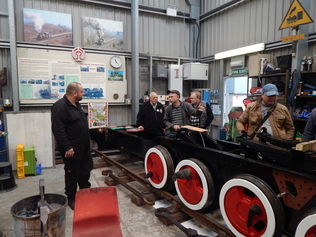 This railway retains a daily diesel-hauled passenger service for locals, but steam is used on summer weekends. 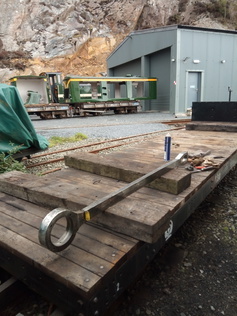 Brake weighshaft bearing, now bushed with a large iglidur bush. Erle and Ed made a press tool for inserting these. 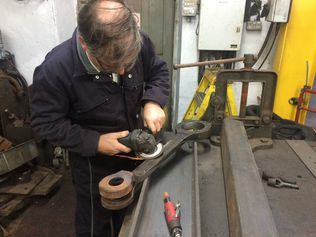 Colin prepares the coupling rods for disassembly, by grinding off the bent-over ends of the taper pins which retain the knuckle joint pins. 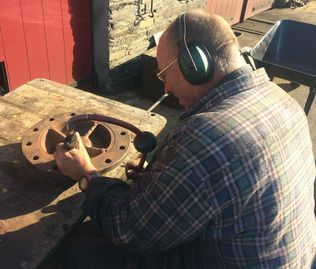 Colin uses a needlegun to clean out scale from the cylinder front covers. 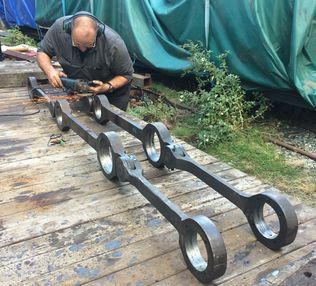 Heating a coupling rod knuckle joint with a large oxy-propane torch. 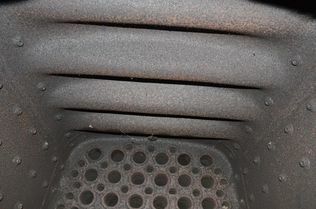 These could not be dismantled when cold. 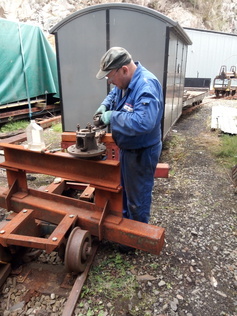 Erle polishes one of the coupling rod sections. 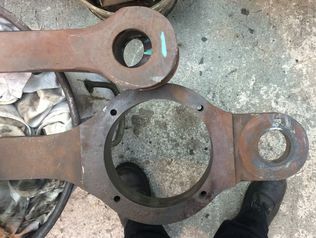 The two parts of the coupling rod knuckle joint. 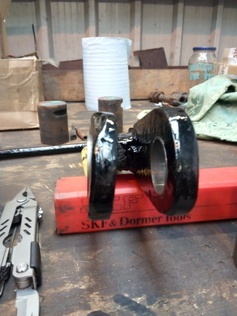 Another batch of brake parts completed. 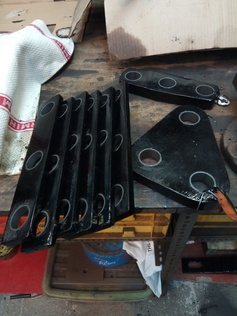 These are for the tender; half of them are new and the others are refurbished old parts. 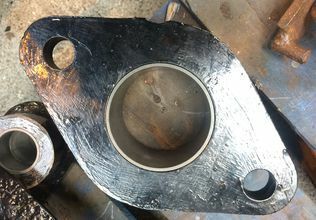 One of the connecting rods, now cleaned and polished and protected with a coat of spray wax. 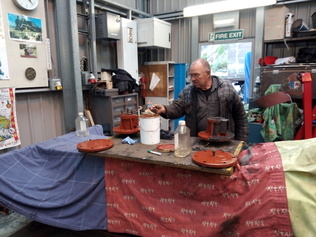 Dave removes rust and scale from one of the rear valve chest covers. 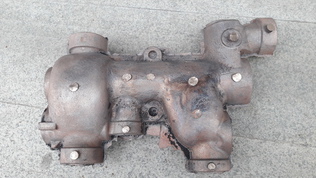 A collection of coupling and connecting rod components, all cleaned up and protected with wax. 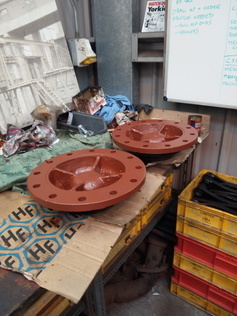 The cylinder front covers are now all cleaned and painted too.